You could spend many hours Googling the term "Bolshevism" and still not get a clear idea of what it is. Bolshevism - What Is It? Suffice to say the Bolsheviks believed in the violent overthrow of capitalism, by any means. So anything that was deemed to be capitalist (owning land, being in particular professional trades etc) could potentially lead you to getting a visit from the NKVD and ending up in you being deported. It's not hard to see how this could be a source of contention for many who ended up airing their views, sometimes in public. This lead to the term "being outspoken against Bolshevism" which in itself was a crime in the USSR, punishable by deportation, even death. So, many polish people had the choice of either quietly accepting the invasion from the USSR in the Kresy region or resisting it and being outspoken about it. Any pole being outspoken against Bolshevism or who was seen to resist it gave the NKVD the leverage they needed to deport them to Siberia and Kazakhstan, which if you will remember from the 1939 Molotov Ribbentrop section suited Russia purposes just fine as they had plans to re-apportion large sections of the eastern block countries between themselves and Germany. This was of course easier to do if large amounts of the inhabitants were no longer there to resist. In trying to make a classless society, Russia decided that certain things would be classed as being Anti-bolshevist, making the person carrying out these actions a target for the NKVD to visit and deport or execute. Refusing to accept an invitation to take the Russian nationality, this was the case in some circumstance and could result in deportation as well. "ASA"(Anti-Soviet Agitation) - This took in: contact with foreigners "with counter-revolutionary purposes", not recognizing the equality of communist political system or striving to overthrow it, non-reporting of a "counter-revolutionary activity, counter-revolutionary sabotage, conscious non-execution or deliberately careless execution of "defined duties", aimed at the weakening of the power of the government and of the functioning of the state apparatus, damage of transport, communication, water supply, warehouses and other buildings or state and communal property with counter-revolutionary purpose etc. Former policemen, former employees of prisons, former officers of military courts. Deserters, political emmigrants, citizens of foreign countries, foreign firms. Former noblemen, estate owners, bankers, commercialists, shop owners, owners of hotels and restuarants. Wow, who isn't on that list! In 1927, Bolshevism introduced a new concept called "enemy of the workers". Although it is oversimplifying things, Bolshevism was aimed at keeping people as classless workers, peasants if you like. Anything that encouraged rising above that or anyone whose activity was "anti-peasant" was essentially anti-bolshevist. The Soviet Union didn't just apply the concepts of this code against Poland in the 1939 invasion. They also applied it against their own people, even returned Soviet prisoners of war. They argued that because the POW had not fought to the death he was essentially anti-soviet and therefore anti-bolshevist. An interesting anti Bolshevist poster from 1919 urging people to join the anti-Bolshevik league. 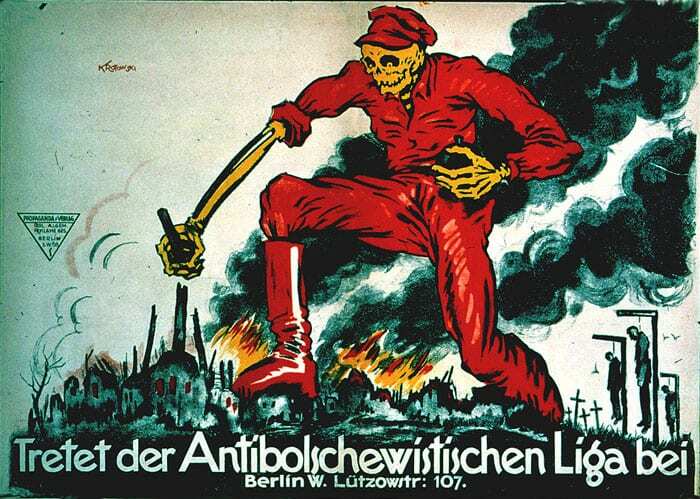 The imagery depicts the image of death, a skeleton in communist red, marching through cities with hand grenades destroying them and leaving people on gallows. Hopefully, you can now see how easy it was to be deemed "anti-bolshevist". It is no wonder then that so many were deported on flimsy trumped up charges that often were suitably vague. You can just imagine the poor polish person after the charges were read out to them, standing there in a state of bewilderment knowing what this meant for them and their family. To know that these trumped up charges ripped entire families apart forever is to understand the evil that was Bolshevism.